I’m a bit embarrassed to admit this, but I bought kale the other day. I kept hearing about it, it seemed like a Good Idea to try it. It’s also excitingly curly and, the deciding factor, rather cheap. I had my first second thought when I got it home. All that exciting curliness makes it take up a great deal of space. I managed to squash it down sufficiently to cram it on top of the cauliflower in the crisper drawer where I left it with its thoughts for a couple of days. My second second thought, which would make it my third thought, came when I started looking for recipes for kale. It turns out that kale is one of the Loony Foods, like spirulina and goji berries, and my old favourite, activated almonds. How did I not know this? People talk about adding it to their diet, rather than just eating it. A worrying number of recipes had the cheery addendum that “they won’t even notice they’re eating it!”. Surely not a great recommendation for eating the stuff. I did see a vaguely tempting recipe for kale chips, which involved washing them and drying them (yawn), tearing them into palm sized pieces, laying them out individually on baking trays (dear lord), spraying them with oil spray and sprinkling them with kosher salt, then either baking them on high for fifteen minutes, or baking them on low for two hours. Or doing them in a dehydrator! Then eating them immediately, because they go soggy fairly rapidly. I bar any recipe that takes thirty times longer to make than consume, so that was out. They seemed way too tough and leathery to eat raw, I dismissed as extra specially loony the suggestion that you whip it up as a smoothie with green apple and nonfat yoghurt. That’s the type of recipe you get when you’re looking at kale recipes, they involve non fat everything, raw nuts, chia seeds, cottage cheese and soy milk. I’m surprised I didn’t see one with tofu, perhaps tofu is a little last decade. 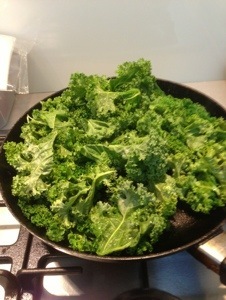 I wonder what kale would be like deep fried? I finally decided that a dip could work, and would go with the fajitas we’re having for dinner tonight. Here’s what I did. Dumped the lot in a sink full of water. Got the frying pan going with a splash of olive oil and a crushed clove of garlic. You rip the kale off the middle stem, discarding any dead moths, and toss it in the frying pan. I didn’t bother drying it, the water helped it cook. The bunch I had was of sufficient volume that I needed to do it in two batches, with a fresh splash of olive oil and clove of garlic the second time around. Meanwhile I set my new blender a challenge. I put in it the juice of a lemon, a chilli from the plant I bought at Bunnings because it was three dollars fifty and right next to the front door, about a quarter of a cup of chopped Parmesan cheese and a tin of canellini beans. I let the kale cool a bit, because the instructions for my blender were quite firm on the kind of temperatures it would be tolerating, presumably because too many people were trying to use it as a cut price Thermomix. Then I squashed it in with the special squashing stick supplied with the blender, which already has a chunk out of it as a result of me not reading all the way to the end of the instructions. It worked best when it was allowed to grumble away on the lowest speed for about five minutes. The final result had the right amount of salt from the cheese, the amount of garlic was about right too. I may as well not have put the chilli in, perhaps they’re decorative rather than fiery. It could do with some heat. It’s overwhelmingly fibrous and not terribly flavoursome. You might eat a lot of it if you feel that you have to atone for some kind of secret sin, but you wouldn’t do it of your own free will. 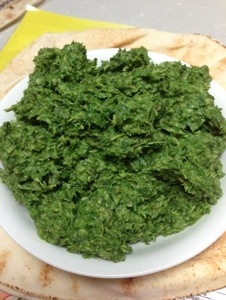 I spread it on some Lebanese bread and rolled it up to eat it. I await the verdict of my capricious digestive system. It will be better in small quantities with the fajitas, but I’m still not making it again. Spinach is far nicer. There’s no way I’ll be able to fool the kids into eating it, I’m on my own with this one. I wonder what sin I can commit to make it all worthwhile? Hi Alison, a friend of mine swears by Kale. She has told me about this delicious salad recipe she has. When shes back from hols, I will get. I haven’t tried Kale either but liked your idea of using it. I’ve always wondered about Kale. Thanks !